CABBAGE (Flat Dutch): 7-inch deep, solid, flat heads, sweet cabbage with green leaves that are tender and crisp with a good amount of vitamins A and C, calcium, potassium, and magnesium; good for storage and making sauerkraut. See Week 6 newsletter for usage and storage tips. -Cilantro: the flat, delicate, lacy-edged leaves and stems of the coriander plant, which look a lot like flat-leaf parsley, but has a distinctive, almost citrus fragrance that lends itself to highly spiced foods, such as tacos, salsas, soups, stews, and salads. -Curly Parsley: curly, dark green leaves, often used as a garnish, but can be used the same as flat-leaf parsley; parsley has a delicate favor that combines well with other herbs like basil, bay leaves, chives, dill weed, garlic, marjoram, mint, oregano and thyme. ONIONS: You will receive Red Zeppelin (medium to large, globe-shaped bulbs with deep red color and will store for six months or more under proper conditions) and/or Copra (medium-sized, dark yellow-skinned storage onions; excellent storage onion staying firm and flavorful after most other varieties have sprouted; highest in sugar of the storage onions; same sulfurous compounds that draw tears inhibit rot, so the more pungent the onion the longer it will store). See Week 10 for usage and storage tips. HOT PEPPERS: You will receive *Shishito (slightly hot, sweet, mild, slender Japanese chiles about 2- to 4-inches with squarish end; often used in stir-fried dishes, salads, or as a pickled condiment), **Red Ember (moderately hot, fruits are sweet with warm heat for a cayenne pepper. “Pepper heads” can eat Red Ember fruits whole, while others craving a touch of heat can slice it thinly for salads. Makes excellent powder or flakes; also nice for hot sauce), ***Jalapeño (hot, small and conical hot chile pepper, ranging from green to red; used commonly in Mexican or southwestern cooking), or ****Serrano (very hot flavor, green cylindrical fruit; usually eaten fresh green in sauces, condiments, or as a key ingredient in fiery Mexican dishes), *Asterisks indicate the level of heat each pepper supposedly has compared with the others according to the seed catalog. See Week 16 newsletter for usage and storage tips. -How to freeze: Bake pumpkin until fork tender at 350 degrees, purée and put cooked pulp in freezer bags. WATERMELON RADISHES: an heirloom Chinese variety of Daikon radishes; large, 2- to 4-inch, round radishes with unique dark magenta flesh and light green/white skin along with a remarkably sweet, delicious taste. -How to use: cooking does minimize the intensity of their color, but can be braised or roasted like a turnip, or mashed like a rutabaga; color is vibrant when served raw in a salad or in a veggie plate with some dip; can also be pickled. WINTER SQUASH: Everyone will receive Butternut (light, tan-colored skin; small seed cavities with thick, cylindrical necks; bright orange, moist, sweet flesh; longest storage potential of all squash) and Delicata (small, oblong, creamy colored with long green stripes, only slightly ribbed; pale yellow, sweet flesh; edible skin; best eaten within 4 months of harvest). See Week 17 for usage and storage tips. 2. SUSHI COOKING CLASS on WEDNESDAY, October 3, from 6 to 8:30 PM: Personal Chef Allison Anastasio Zeglis, from www.lastbitechef.com will show you how to prepare several kinds of sushi. Get hands on experience preparing a meal using fall produce in a way that you can recreate in your own kitchen. Then stay to enjoy a delicious sushi-inspired meal! Please register with OCTOBER COOKING CLASS in the Subject Line and your NAME, PHONE, and EMAIL ADDRESS. Please bring $15/person. Possibly room for 1 or 2 more…. 3. “EXTENDED FALL CSA” SHARE REGISTRION IS OPEN: This 3-week share runs from Oct. 14 through Nov. 3 for $108 (this amount has been corrected from a previous week, which incorrectly said $110!) celebrating all the bounty of the fall vegetables! 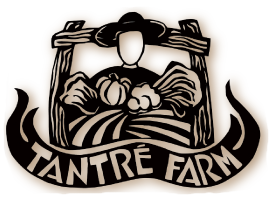 The link for online registration is http://tantrefarm.csasignup.com . Please sign up by Saturday, Oct. 13, so you won’t miss any of those 3 weeks of produce. Please go to our website for more information. We are prorating these shares as well, so if you need to miss a week of the Extended Fall CSA, just send us an email, and we will register you for the weeks you will receive a share. Hope to share more of this abundant fall harvest with you throughout October! Tell your friends and family!! Due to outside exposure of potentially cold-damaging temperatures in October, we will not have Fall Shares at the Chelsea Farmers Market or at MOVE, since we have no way to protect these shares, so please find alternate pick up locations. 4. THANKSGIVING CSA on November 17: This CSA is NOT open for registration just yet, but we wanted to let you know about it, since it will open soon. A more detailed email notice about this will come out to you sometime in the next week or so. This share is a one time pick up of 60 to 80 pounds of produce for winter storage or to stock up on vegetables before the holiday for $120. This share will be available for pick up on the Saturday before Thanksgiving at the Ann Arbor Farmers’ Market from 7 A.M. until Noon or at Tantré Farm from 2-5 P.M.
5. PLASTIC/PAPER GROCERY BAGS NEEDED, if you can donate some to the farm or at markets. We are running very low! 6. WEEDING VOLUNTEERS NEEDED!! We still could use the extra hands in getting some major weeding done. Please contact us. 7. U-PICK FLOWERS AVAILABLE: You may pick 1 bouquet of 16 stems per household each week for “free” in the u-pick flower garden on the farm until the first frost. Extra bouquets – $4. Warm the oil in a large soup pot on medium heat. Add the onions and garlic, and sauté for 5 minutes. Add the squash, celery, carrots, potatoes, oregano, salt, pepper, and water; cook for 10 minutes or until potatoes are almost done. Add the kale and beans (drained) and simmer for another 5 to 7 minutes, until the kale is tender and the beans are hot. Yields 12 cups. Serves 6 to 8. Peel the very outer layer off the radishes–not too much, because you still want the outer layer to look green. Grate or shred the watermelon radishes using a Kyocera julienne slicer, or the largest holes of a box grater, or your food processor. In a large bowl, toss the watermelon radish shreds with the lemon juice and olive oil, and add a pinch of salt. Taste and add more salt if you like. Serve chilled. Heat the butter and oil in a heavy pan over medium heat. Add the onion; saute until lightly browned, about 20 minutes. Add the ginger; cook for 3 more minutes. Stir in the curry powder, jalapeno, cloves, and cardamom; cook for 2 minutes, stirring constantly. Add the pumpkin chunks, coconut milk, raisins, and maple syrup. Cover; cook over low heat until the pumpkin is tender, about 30 minutes. Uncover, and if the sauce is thin, let the coconut milk boil away until the mixture thickens to your liking. Season with salt and pepper to taste.